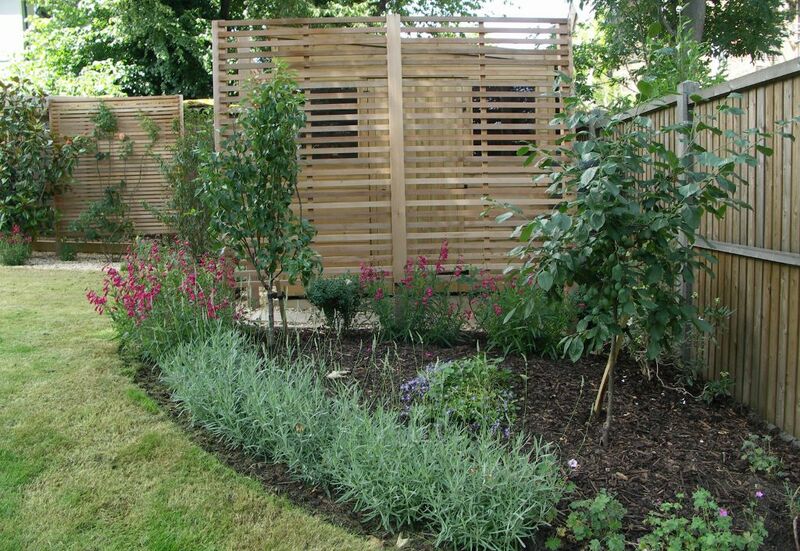 Cedar screens provide a very effective way to cover unsightly boundaries. 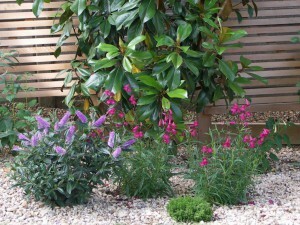 They are very attractive in their own right and provide a backdrop for a wide range of planting. Cedar is a long lasting and low maintenance softwood. Here in Highgate, the cedar screens have been used to obscure garages and a large shed. 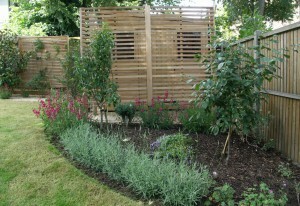 The garden is sloping so we designed the cedar screens to step down across the back of the garden. The lateral slats give a feeling of width and are closely spaced to almost completely obscure the garages behind. The gaps between the screens create a softer line and provide spaces for tall evergreen shrubs. The planting includes a beautiful Magnolia grandiflora ‘Gallissoniere Praecox’ which has huge goblet-shaped white scented flowers. A few are in bud now. 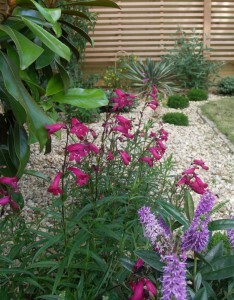 In front of the screens, apricot pebbles set-off Penstemon ‘Garnet’ and Hebe ‘Lisa’. The shadows cast on the screens are interesting too. This picture also shows tall Achillea filipendulina ‘Cloth of Gold’ with its flat bright yellow caps. The new shed is in natural pressure-treated softwood. 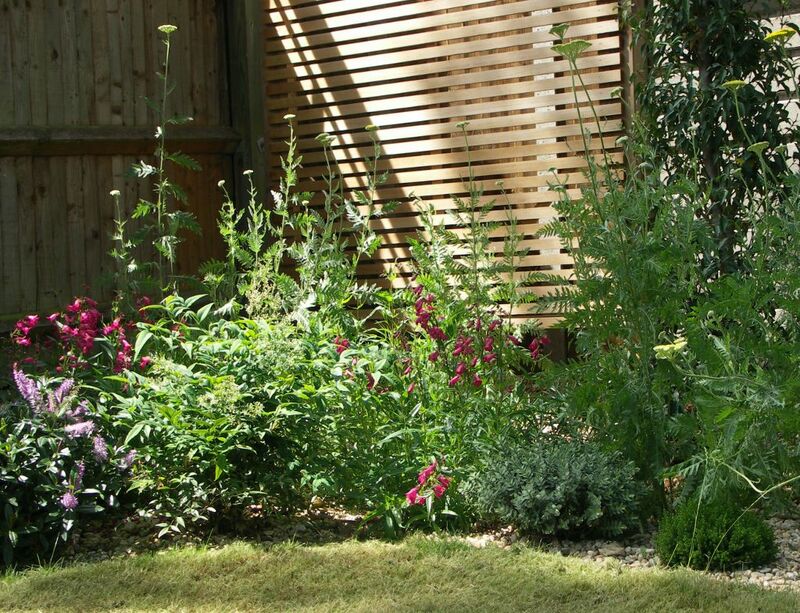 The cedar screens around this have a wider spacing. In time, they will be covered in jasmines, buddleja and roses. The quadrant border is edged with Lavandula x intermedia Dutch Group. This has long lavender flowers and a strong fragrance. 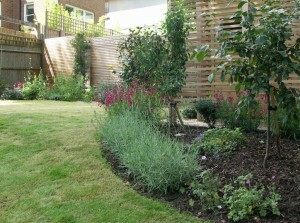 A pear and a plum tree are planted in the border. The long border with apricot pebbles includes Yucca gloriosa ‘Variegata’, Buddleja ‘Royal Red’ , hebes and jasmines. This entry was posted in Cedar Screens and tagged Apricot pebbles, Cedar screens, Garden Design, Highgate, lateral slats, Leaf & Acre, Magnolia grandiflora 'Gallissoniere Praecox', North London, Penstemmon 'Garnet', Planting Design, sloping garden on July 4, 2015 by admin.